Much like CW's hit series Arrow before it, the first season of The Flash introduced a slew of characters from the DC Comics. One of those characters is Ronnie Raymond, played by Robbie Amell, who starts off the first season as just the fiancee of Caitlin Snow (Danielle Panabaker), and eventually transforms into one half of Firestorm, along with Victor Garber's Dr. Martin Stein. Victor Garber has been confirmed as one of the stars of CW's next spinoff, DC's Legends of Tomorrow, which includes characters from both Arrow and The Flash, but Robbie Amell has not been announced as a part of the series. Victor Garber has recently teased in interviews that Ronnie will be present in some way, so when I spoke to Robbie Amell about The DUFF, available on Blu-ray and DVD today, I asked him about his involvement in DC's Legends of Tomorrow. Here's what he had to say below. "All of those questions will be answered shortly, but I can't actually tell you anything about it. What I can tell you is I'm going back to shoot more episodes of The Flash in July." The actor went on to confirm that The Flash Season 2 picks up directly after the Season 1 finale, to address the massive cliffhanger, where Barry (Grant Gustin) sped into the massive wormhole to save the day yet again. When asked about what he would like to see happen with Ronnie in the new season, the actor had this to say. "I haven't gotten any scripts yet, but it picks up immediately where the finale left off, because it was such a big cliffhanger, you have to. I don't know what I'd like to see. The nice thing about the finale was getting to actually play Ronnie. You saw Ronnie in my first episode, and then I was this schizophrenic, frightened man, and then I was trying to figure things out with my other half, and I finally got to kind of play Ronnie in the finale. I was enjoying that character. I'd like to play more with that, and the relationship with Danielle Panabaker's character Caitlin, but I always have so much fun shooting with Victor, so anything else Victor and I can shoot together would be great." Robbie Amell was also part of a clever piece of crossover marketing for both Arrow and The Flash called "Superhero Fight Club," where heroes and villains from both shows "blow off some steam" by fighting in a massive steel cage. When asked if this premise would ever be included in the show itself, Robbie Amell had this to say. I don't know who's idea it was, creatively, but we were doing just a photo shoot, and they were like, 'By the way, there's a stage.' Glen Winter, who directed a bunch of episodes, directed it, and Bam Bam and all of the fight choreographers from Arrow and The Flash, all choreographed. They just banged it out in like a day and a half of photoshoots, grabbing people when they could, and it was unbelievably smart. I know nothing more than what you've seen. There's been no talk of implementing it, but it was one of the best marketing strategies I've seen in a long time. It was a blast to shoot, and I would absolutely love to do some more Superhero Fight Club stuff." The Flash will return this fall on The CW, returning to its Tuesday 8 PM time slot, while the spinoff DC's Legends of Tomorrow is slated to debut in midseason. 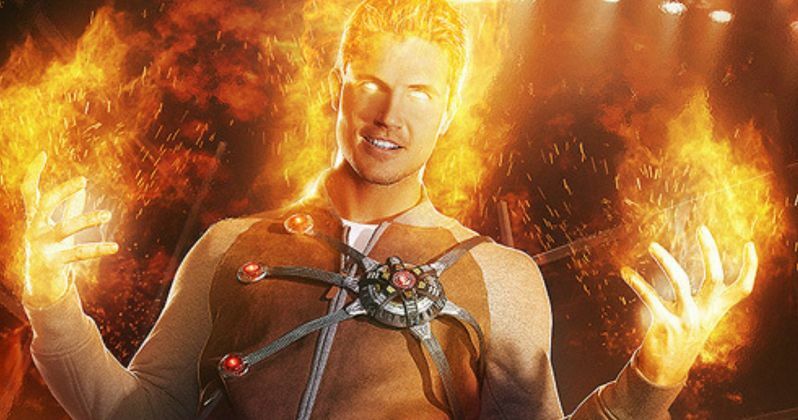 Do you think Robbie Amell should be a part of DC's Legends of Tomorrow? Or would you like to see more of his Ronnie Raymond character on The Flash instead? Chime in with your thoughts, and in case you missed it when it debuted in April, check out the Superhero Fight Club trailer below.